In a departure from her Mrs. Pollifax series (Mrs. Pollifax Unveiled, 2000, etc. ), Gilman revisits Madame Karitska, a psychic from a previous novel (The Clairvoyant Countess, not reviewed) whose full name, Countess Marina Elena Provotchnichet Gaylord Von Domm Karitska, reflects her exotic and checkered past. She has set up shop (“Madame Karitska, Readings”) in a seedy Bohemian section of New York City. The people from all walks of life who consult her include Detective Lieutenant Pruden, who reluctantly relies on her clairvoyance and her psychometric ability to perceive something about people from objects they have handled to help him with tough cases. Now Madame Karitska literally brings a case to him: a briefcase full of diamonds that an old acquaintance, pursued by an evil-looking character, tossed to her on a subway. In turn, Pruden asks Madame to “read” a gold cross worn by a young music student killed in an apparent hit-and-run accident. When she picks up the cross, Madame sees an alarming obsession. Another client brings her the ring worn by her husband, passionately committed to the same cultlike organization that claimed the daughter of an old friend and former client. With each case, the stakes grow, but Madam Karitska sails through them all with the calm, compassionate wisdom of a combination social worker, matchmaker, and nemesis. 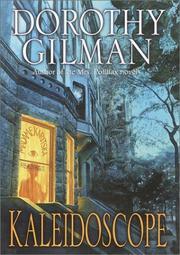 Madame Karitska is an appealing figure, and Gilman handles the psychic aspects of these episodes with refreshingly down-to-earth practicality, but Kaleidoscope remains an uneven collection of short stories, ranging from the sentimental to the melodramatic.